The east coast of Australia is facing an early spring heatwave this weekend, with temperatures soaring past 40 degrees Celsius in some areas of the country. 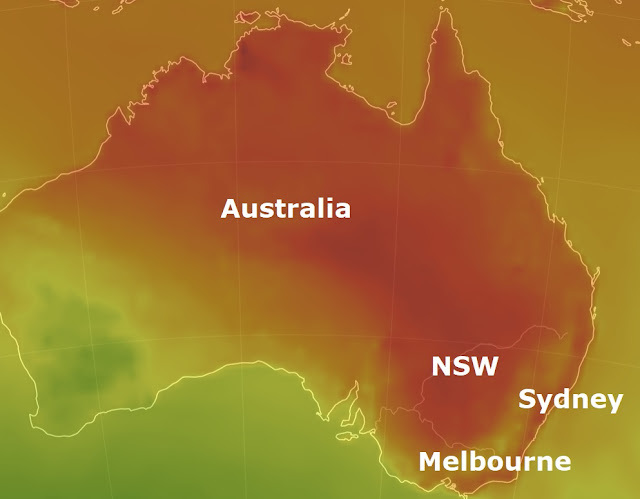 In NSW, the Bureau of Meteorology (BOM) said the mercury hit 40C at Wilcannia airport about 1:00pm, in what is a new September record for New South Wales. The BOM said the last record of 39.6C was set in 2004. Other areas of the state are expected to reach the high 30s, with total fire bans in place across NSW - including the Greater Sydney region, the Greater Hunter, the Illawarra/Shoalhaven and Central Ranges. At Tibooburra in the states north-west it was approaching 39C. Local hotel owner Mavis Jackson said it was "pretty miserable" there. "[It's] very, very dusty even inside on the floor blowing in at the moment, it's all dust so it's not a real pleasant type of atmosphere," she said. The temperatures are well-above the September average for Sydney, with the maximum usually about 20C. BOM duty forecaster Mohammed Nabi said strong winds would push the heat from the middle of Australia across NSW. Parts of Queensland are also set for unseasonably warm conditions, with Brisbane expected to reach 34C this weekend, the BOM said. That is almost 10 degrees higher than the average for this time of year. The hot and dry conditions have also prompted fears for significant bushfires, with extreme fire danger warnings in place for the Maranoa and Warrego. The Rural Fire Service said there were 11 uncontained fires burning across NSW at 1:30pm. Other parts of southern Queensland are also under severe warnings. Queensland Fire and Emergency Services spokesman James Haig said standby fire crews and extra aircraft are ready to respond. Forest Fire Management's Scott Falconer warned. "I would describe this as a bit of a wake-up call that the season's changed," he said. Firefighters are on standby in the Mallee, in the state's north-west, where temperatures are forecast to reach the mid-30s with winds gusting up to 90 kilometres per hour. That is also higher than the average maximum experienced in Victoria during September, with temperatures usually just below 20C.